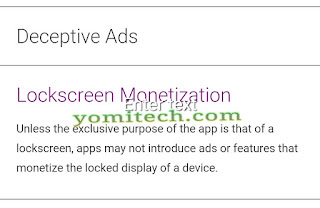 Ads is one of the different ways developers monitize their Apps especially when they are free apps, but they get very annoying sometimes especially when they disrupt what you are doing on your phone and some Ads even goes as far as popping up even when your phone is locked. Now Google has just made changes to the PlayStore policies and Apps that place obtrusive ads on your phone's lock screen will no longer be allowed. The new changes will affect all Apps except those that actually replaces your default lock screen. 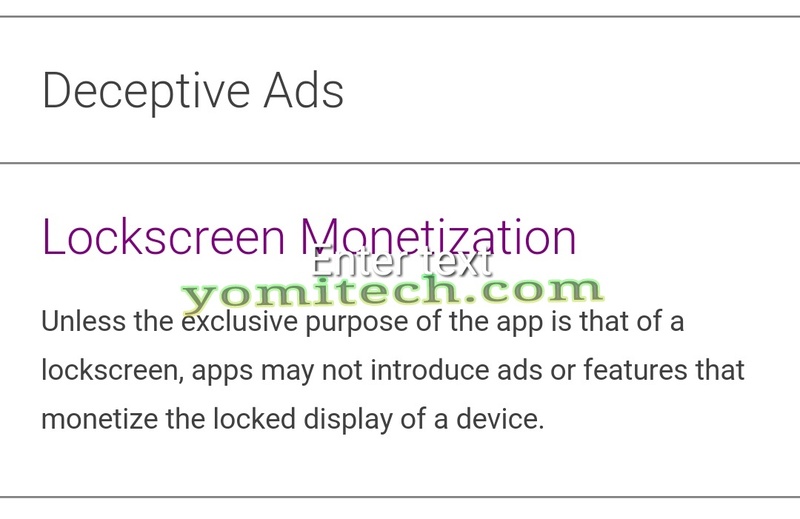 "Unless the exclusive purpose of the app is that of a lockscreen, apps may not introduce ads or features that monetize the locked display of a device." What this means is that if you are installing a third party lock screen App to replace your default lock screen then the Ads will still be allowed to pop-up when your phone is locked but other apps like music players, games, browsers etc will not be allowed. tnx alot! Not to see ads at all,beta root fone& install luckypatcher,AFWall+[donate version] & adaway. Goodluck"